The Fremont Stamp Club is pleased to post the January 2014 quarterly issue of The Council Courier, the newsletter for the Council of Northern California Philatelic Societies. The council promotes philately in the northern California region for clubs and member societies. 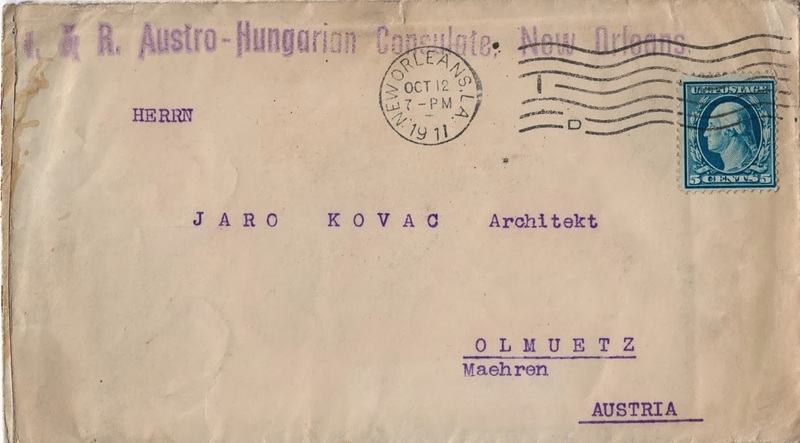 The Austro-Hungarian Consulate -- in New Orleans! 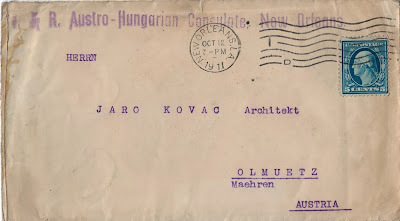 I recently bought the cover below that originated from the Austro-Hungarian Consulate in New Orleans. One does not normally associate Austria-Hungary, a long defunct empire, with New Orleans. This cover intrigued me and I decided to do some research. I found an excellent book on Austro-Hungarian missions in the US. It is entitled Austria (-Hungary) and Its Consulates in the United States of America since 1820 by Rudolf Agstner, a diplomat in the Austrian foreign service. He had a small section on the New Orleans consulate and it had a long history dating back to 1837. In fact there were many consulates scattered across the South. The reason: economics (trade) especially cotton. The consulate in New Orleans lasted until April 1917 when the US declared war on the Central Powers. I wish that I could tell you stories of intrigue and spying at the New Orleans consulate. No such luck. I did find out that the last honorary consul in New Orleans was Franz Hindermann. He served for twenty-one years. One night in 1908 someone broke into the consulate and ransacked the files. According to Mr. Agstner, no files remain past 1908. Interestingly, the cover I bought is dated 1911. Oh yes, I almost forgot. I was puzzled by the I&R in the upper left hand corner of the cover. A quick search revealed that it stands for Imperial and Royal. I look forward acquiring other such diplomatic covers related to the Empire. I really enjoy perusing the listings on eBay for philatelic items. Sometimes I run across an item of which I know nothing yet want to learn about its history. To me this is the best part of stamp collecting. One such item was a cover addressed to Countess Alexandra Tolstoy at the Tolstoy Foundation in New York dated April 2, 1939. I never heard of this organization nor did I know anything about Alexandra Tolstoy. Thanks to the internet, I was able to gather some great background info on her in a matter of minutes. The youngest daughter of the noted author, she fled the USSR in 1929 to the US after being imprisoned by the communist government. Understanding the plight of Russian refugees, she set up the foundation in 1939 along with several other motivated individuals. I found a wonderful essay online written by Scott Moss entitled A History of the Tolstoy Foundation 1939 - 1989. The essay is almost forty pages and thoroughly discusses the foundation's activities over the years. The foundation's early years were quite challenging. Ms. Tolstoy started in a room donated by an Episcopal church in New York with funds totaling $25. Several years later they were sending several hundred thousand dollars to help captured Russian soldiers during the Russo-Finnish War. As with future conflicts, the biggest problem was repatriation to the USSR which often meant a death sentence. The Foundation moved to its present day rural location in New York in 1941, allowing more room for its activities. Over the years the mission of the organization expanded to serving non-Russians. Unfortunately the Foundation's website is not active at the time of this writing according to their "under construction" message. The cover I purchased was sent to the Foundation for the first two years they were located in the one room in the Episcopal church on Fourth Avenue. This fact makes the cover more special. Also, note the War Prisoner's Aid cachet in the lower left hand corner.